Frederick, Maryland is an outlying anchor city of the Baltimore-Washington Metropolitan Area. Located about 50 miles from both downtown Washington and downtown Baltimore, Frederick is both a commuter exurb and a city in its own right. With a population of about 60,000, Frederick is the third largest incorporated city in Maryland, after Baltimore and Rockville, and is also the gateway to points west from the DC-Baltimore metropolitan area. An unusual characteristic about Frederick is, despite a relatively small size, it is home to two medium-sized shopping malls. Frederick Towne Mall, located on the “Golden Mile” retail strip of U.S. 40 on the west side of town, was the first mall in town, and opened to massive fanfare in 1972. 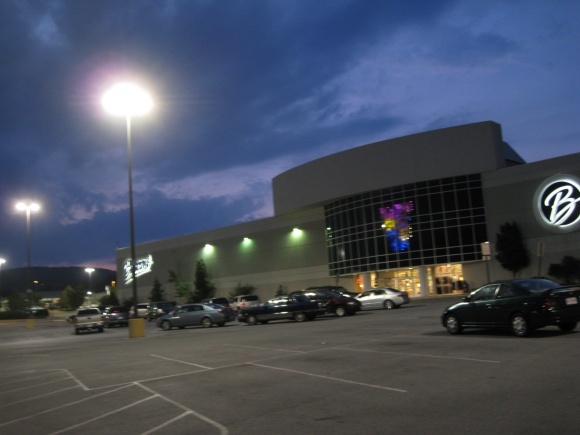 Francis Scott Key Mall, which opened a few years later in 1978, anchors another retail area on the south side of town adjacent to Interstate 70, which goes east to Baltimore, and Interstate 270, which goes south to Montgomery County and Washington, D.C. 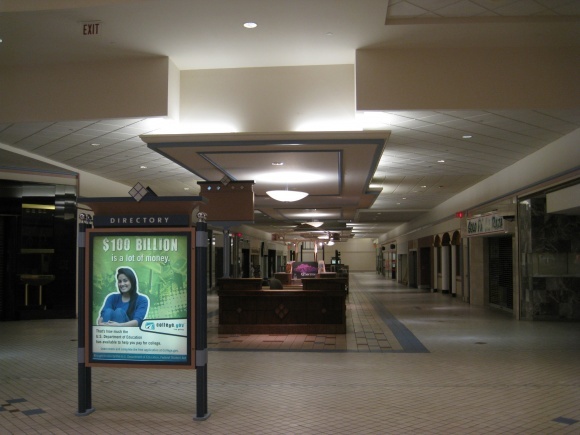 In a classic case of regional retail overload, the Francis Scott Key Mall and its surrounding retail area gradually became the dominant retail area in town, replacing Frederick’s Golden Mile and the Towne Mall that anchors it. 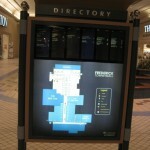 Other regional malls were also constructed in the nearby cities of Martinsburg, Hagerstown, Chambersburg, Westminster, as well as in monied Montgomery County, giving residents from nearby places little reason to come to Frederick to do their shopping. In addition, the offerings constructed in Montgomery County and Northern Virginia became a draw for Frederick residents who were seeking a more total and slightly upscale retail experience. 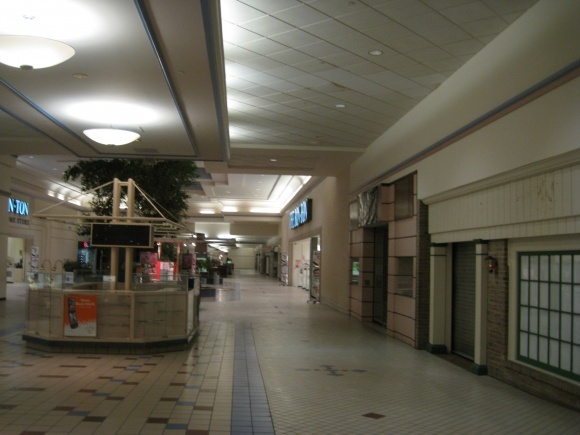 As a result, having two malls in Frederick proved to be two too many. 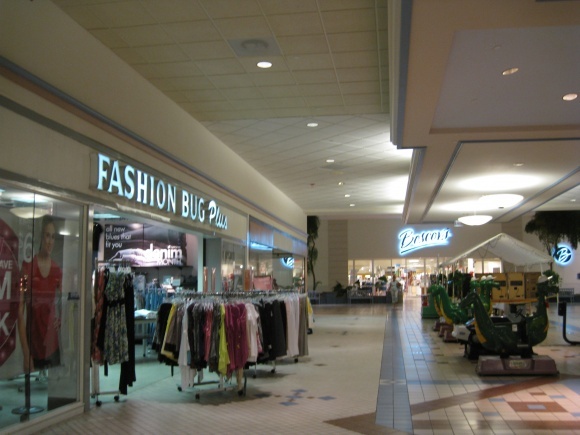 So which mall would Frederick choose to support, and which mall would be thrown in the trash? The answer would be informed by demographic shift, creating crime or the perception thereof, a dash of mother nature, and three cups of competition. 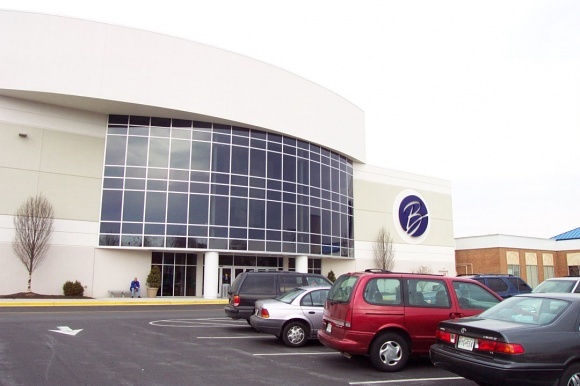 Beginning as early as the late 1970s, and ramping up through the 1990s, the retail dominance in Frederick began to shift from the Golden Mile/Towne Mall area to the area around Francis Scott Key Mall, along MD Highway 85. This was precipitated by a few factors. First, as we mentioned above, the region was saturated with regional malls in nearly every direction, negating the necessity for having two of them in town. 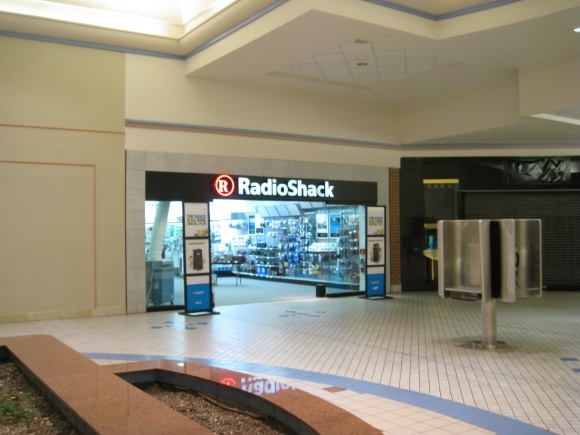 A major shift in local demographics also informed where the dominant retail placement would be. The area around the Golden Mile became home to more and more low income housing, and after a series of events, earned a reputation for crime. 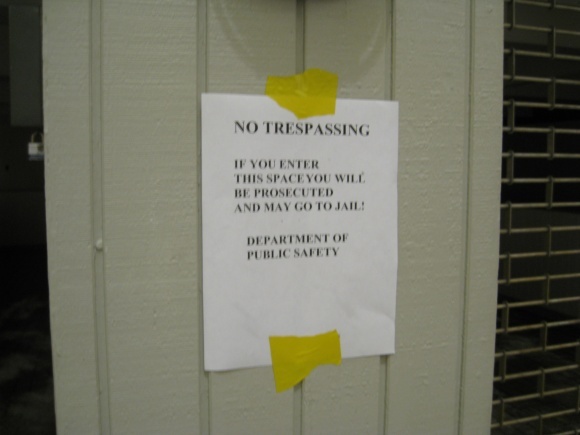 Violent crime surrounded the area of Towne Mall, and frequent fights began to break out in the mall itself. 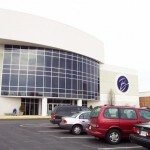 These events became well publicized in the media, and locals began reallocating their dollars to the safer retail district across town, near Francis Scott Key Mall. Mother nature played a role, too. The creek behind the mall is prone to flooding, and a significant portion of the mall is within the 100-year floodplain. This makes it tough for anyone who wants to ameliorate the decline of the area, because FEMA has very specific and complicated rules about development in the floodplain, even prohibiting renovations on existing structures. Topography is also a major factor that has limited new development along the Golden Mile. Because of large hills on either side of U.S. 40, development is limited to a short space along the highway corridor, and most of the corridor is already built out. In response to these challenges on the Golden Mile, developers chose to build a new retail corridor, centered around Francis Scott Key Mall across town. The new retail corridor would not have any of these challenges, and would have access from both interstates 70 and 270. 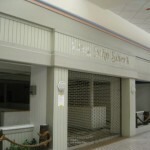 In 2001, Montgomery Ward closed their doors nationwide, including their store at Towne Mall. It was eventually replaced by a Home Depot in 2004, which does not have mall access. 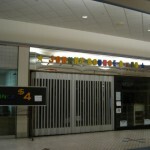 The next store to defect from Towne Mall was JCPenney, which moved to FSK Mall in the early 2000s. 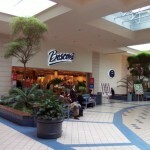 It wasn’t a terrible blow, however, because the space was swiftly replaced by Boscov’s in October 2003. 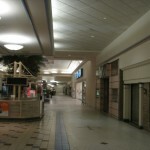 Despite retaining three anchors throughout most of its history, the interior of Towne Mall has suffered the most over the past decade. 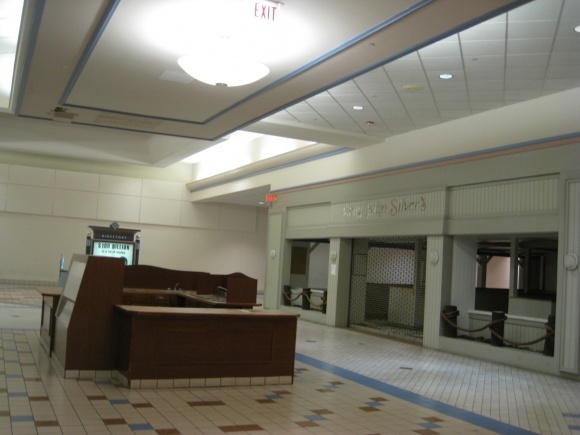 Longtime tenants like Chanticleer Shoes, Gentlemans Choice, Long John Silvers, and others have either closed or relocated, leaving the interior corridor of the mall awash with dead stores and few patrons. The few stores left cater mostly to either a low income or specialty niche, with several dollar stores and even a dead store converted to a bouncy castle. 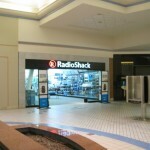 The Radio Shack in the mall, which was still open as of August 2010, said that 75 percent of their business was providing cell phones to hispanic customers. 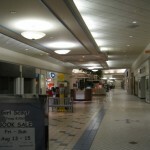 After all the problems, mall owners were quick to react to the situation, and put together plans to renovate the mall into a mixed-use lifestyle center in 2005. The plan was approved in 2006, and included a new parking deck to the north of the Bon Ton anchor, a line of residential condos, space for new outparcels, and a total remodeling of the mall, demolishing the interior corridors and replacing them with outdoor ones. However, a few years went by, and murmurs about redevelopment were quieted due to the economy, lack of intered from leasing parties, and the inability to secure credit to build the project. In 2009, the local paper revealed that a new developer was on board, and that plans may have changed. A spokesman for the developer, DLC Management, said that they were evaluating and formulating their plan in 2009, and as of 2010 had not brought forth anything concrete. Reading in between the lines, it looks like nothing is going to happen here until the place either falls down or closes permanently and becomes a blighted eyesore, “requiring” more financial assistance from the government to be redeveloped. DLC’s page on Frederick Towne Mall links to a storetrax profile which provides absolutely no clues either. 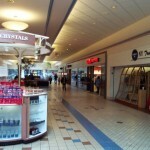 We visited Frederick Towne Mall in March 2004 and again in August 2010. The difference between those two periods is stark, as the mall was only beginning to show vacancies in 2004 and in 2010 is on life support. 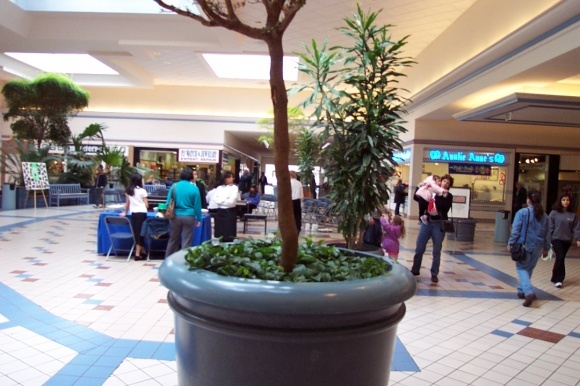 In 2010, the security guard didn’t even have much to do, he was just sitting near the Boscov’s anchor looking bored. There’s a Facebook page on this mall that I used to be a part of. Did this mall formerly have a Hess’s department store anchor? 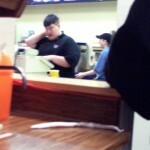 Or am I confusing it with the one in Hagerstown? Nope. Neither had Hess’s. Hess’s was at FSK when it opened. Frederick Towne had a better anchor lineup. FSK opened with Sears, Hess’s and Gee Bee. This configuration remained until the early 90’s when Leggett opened at the mall and Hess’s went to Hecht’s. When Belk acquired Leggett, they got rid of the stores closest to DC (Manassas and Frederick) and sold both to JCPenney. JCPenney briefly operated at Frederick Towne as a Home Store only in the 2-level store at the end before leaving altogether. 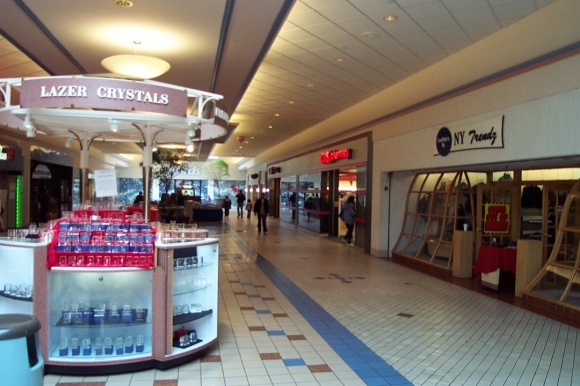 The anchors at Valley Mall in Hagerstown and Frederick Towne Mall originally were the same. They were developed by the same company. Frederick Towne opened a little sooner. The layouts and sizes were very similar. Both had JCPenney, Montgomery Ward, Bon-Ton (Hagerstown opened as Eyerly’s, became Bon-Ton) and McCrory. As stated, the availability of land was the catalyst as the big-box stores could not develop anywhere near Frederick Towne. Toys R Us is across from the mall, but other than that, there’s little else on that side other than lower-income stuff. 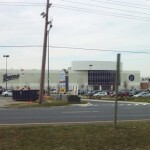 FSK became surrounded by Walmart, Target, Lowe’s, Home Depot, Sam’s, Costco, Best Buy, Circuit City, etc. and was a little larger. I really don’t know why Boscov’s chose to leave its location at this mall open while closing its store at the successful White Marsh Mall a couple years ago. The only logical explanation I can think of is that the chain really does perform better in dead malls than in healthy ones (where the competition is tougher). 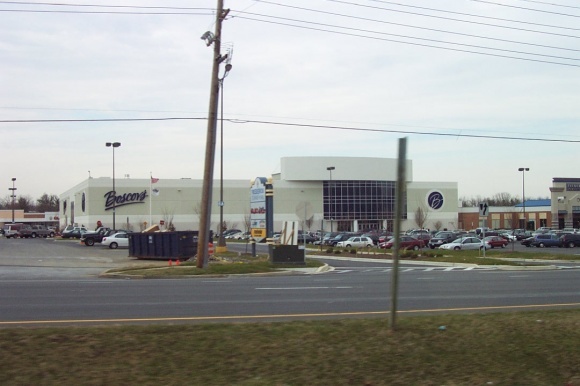 @Max, Boscov’s closed many stores when the White Marsh location also closed. It is a good chain though. Demographics/People have changed though and not for the better. 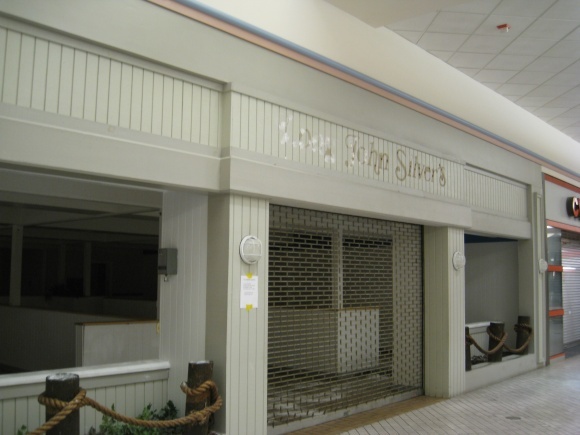 Boscov”s huge expansion of 06-07 came at a bad time. The Altoona, Pa.. store does well. But I agree that they fair better in low competition. 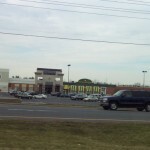 I doubt any mall to west of Frederick had any impact on this mall as well as FSK. Hagerstown’s Valley Mall opened in 1974 only a few years after Frederick Towne Mall did and the two malls had done just fine serving their own cities back in the day. Chambersburg, PA…their mall is actually to the north of that town towards Harrisburg and also considering the distance between the two places, I just can’t see very many people making that drive from Chambersburg to Frederick for really, well anything. 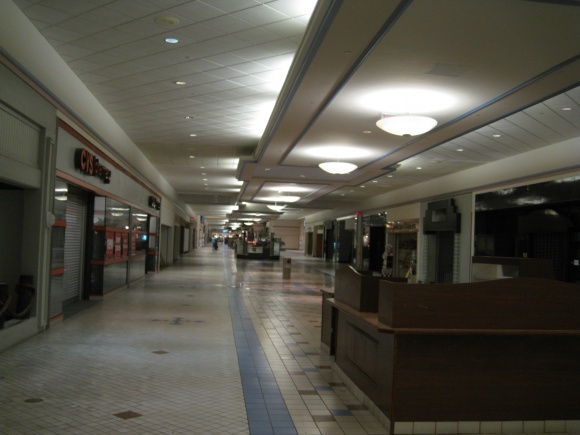 Martinsburg, West Virginia…..their mall has been a joke from day one from so many locals. One “issue” was that back in the late 80’s when plans were first announced for the Martinsburg Mall, because of “Berkeley County growth”, a lot of people were really expecting a mall with a Nordstrom, Saks and Lord & Taylor only to get a mall with a Walmart, Hess, Sears and JC Penney ( chains found in nearby towns )..and to this day there are still those who won’t shop there because of it !! Also Martinsburg and that surround area, people there tend to go to Winchester VA’s Apple Blossom Mall and Hagerstown’s Valley Mall or one of the many Northern Virginia malls when they get that “mall urge” and besides Martinsburg only recently had gotten its first batch of big box stores however all of them already have locations in either nearby Hagerstown or Winchester or both. Like Chambersburg, I don’t believe there were too many of those from Martinsburg who had made that trip to Frederick just to shop either..not when one can find things closer anyway. 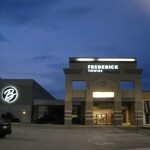 Back to Frederick..wasn’t there plans at one timeback in the late 80’s-early 90’s to had build a THIRD mall in Frederick? For some reason I seem to recall hearing about this on WFMD back then. But came the recession of 1991 and I never did hear anything about this “third mall” ever again. The $4.77 Store seemed to be liked, if only as a parody. Wow, this one really drove off a cliff between ’04 and ’10, which is a shame because aside from the dated flooring, the rest still looks well-kept and fairly contemporary…though I don’t care for the back-lit dropped ceilings in the Wards wing, which look low enough without the hanging chandeliers. 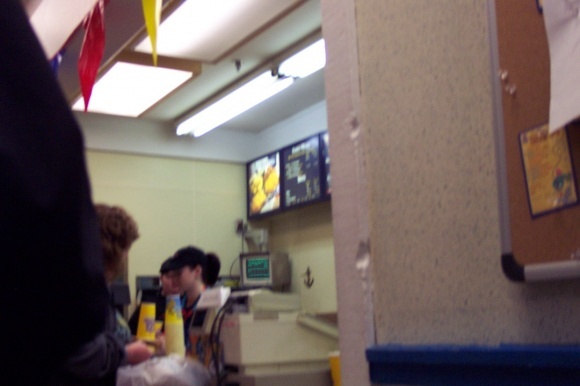 Also, it’s been a really long time since I’ve seen a Long John Silver’s or Ground Round in a mall. Max, I was living pretty close to Baltimore in 2007, and I frequently visited the Boscov’s at White Marsh and at Marley Station, and I am not the slightest bit surprised both of them closed. 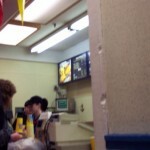 Neither of them had hardly any customers. Then again, Marley Station through the entire mall was pretty dead. Note that Boscov’s couldn’t make it at Owings Mills, but is still going 15 minutes north in Westminster. The same rings true in Frederick. There’s a very different culture between the 81 corridor (which I think is most shaped through Central PA when you look at supermarkets, banks, etc.) and the Baltimore/DC area. Frederick, while geographically positioned perfectly between Baltimore and DC, having predominantly Baltimore/DC supermarkets (Giant, SuperFresh and Safeway are still around, Shoppers used to be there), it’s still culturally more in tune with the 81 corridor, even if people are going to work in Montgomery County and points southward on 270. Boscov’s tends to struggle outside its familiar areas. I visited the store at Monroeville, a really nice former 3-level Gimbel’s/Kaufmann’s, and it just couldn’t get traffic. Boscov’s amazes me sometimes how well their stores do in Central PA, especially in some really underperforming malls, and in some of the smaller areas with merchandise no worse than, and in many cases better than what you’ll find at Macy’s. 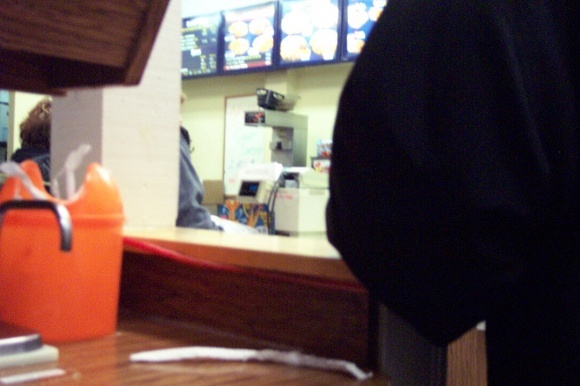 And Danonymous, Long John Silver’s only-ever stores in the Hagerstown/Frederick area were in malls. I take it you’ve never been to Valley Mall in Hagerstown where there’s still a very dated LJS in the mall next to JCPenney. I believe a lot of LJS locations were in malls around the 1970s and 1980s. Century III and I believe Westmoreland Mall in the Pittsburgh area had a Long John Silvers in the mall around that time. I would underscore Daniel’s point about the culture in Frederick. I’ve been teaching at a U Maryland branch that draws from Montgomery and Frederick Counties and have learned a lot out the differences between the two places. Although house prices have pushed some people from Montgomery into Frederick County and research facilities like Fort Detrick and NCI have attracted more cosmopolitan newcomers, Frederick remains fairly distinctive. Things tend to be run by the same people who’ve always run them and outsiders often feel unwelcome. People with DC or Montgomery County jobs looking for cheaper housing tend to go toward Howard County (Columbia) where the schools have a much better rep than those in Frederick. There’s also a contingent that has gone to Harper’s Ferry WV, which is much cheaper and has access to commuter rail. Harper’s Ferry also has a bit more charm and an outdoorsy feel, although those come with having to put up with tourists and daytrippers. The DC meets Baltimore market is more what you’d find in Columbia, Laurel, or Annapolis, although each get a distinctively different mix of people, in terms of SES and social background. Conversely, the I-81 corridor is largely unknown to DCers, unless they use it to avoid I-95 for points North or have some connection to the Shennandoah region or Central PA. My own experience of Frederick is that it’s easy to get lost there and I’m most happy when I’ve passed it on my way to/from the PA Tpke. My reaction is pretty common and I suspect this mall will only survive if its local market permits it. If it’s on the wrong side of the tracks, that may be tough. Frederick has, in fact, gotten a lot of the northward migration from Montgomery — more than Howard has. (Sources: http://www.city-data.com/county/Montgomery_County-MD.html and http://www.city-data.com/county/Frederick_County-MD.html). Some of that is because it’s cheaper; it’s hard to turn down an actual house for the price of a shopworn townhouse in Montgomery Village or Germantown, especially when those areas have problems with crime and not-so-great schools (at least by MontCo standards), and when the commute is going to stink no matter what. Some of it is for other reasons — namely, the fact that Frederick County is less diverse and far more conservative than MontCo. Like it or not, that’s still a big selling point for some people; closer to Baltimore, Carroll County has benefited greatly from the massive waves of white flight that have resonated through western suburbs like Woodlawn and Randallstown (with Owings Mills arguably next on the list). On that note, I wonder how much the pockets of crime in those apartments behind the mall really sealed Frederick Towne’s fate. That part of town certainly isn’t great (I’ve heard the horror stories from former coworkers who were lured in by the cheap rent), but it’s only one of several rough spots dispersed throughout the city. Downtown still has its fair share of rundown, sketchy-looking rowhouses, but that hasn’t stopped it from burgeoning as a regional draw for foodies, artists, antique lovers, and others who simply want a break from the DC rat race and the monotony of its suburbs. @DayGlo!, means and medians aren’t meaningful when the tails are big–Montgy has more concentrated wealth and poverty than Howard. That said, Columbia is more appealing to people than Frederick, because of the schools and I know plenty of people who commute to Bethesda/Rockville from upper Silver Spring, Baltimore County, and Baltimore City. Frederick manages to get an occasional spot in the Post, but it’s hardly a foodie destination in the same way as Bethesda or the the more ethnic sections of Montgy County. 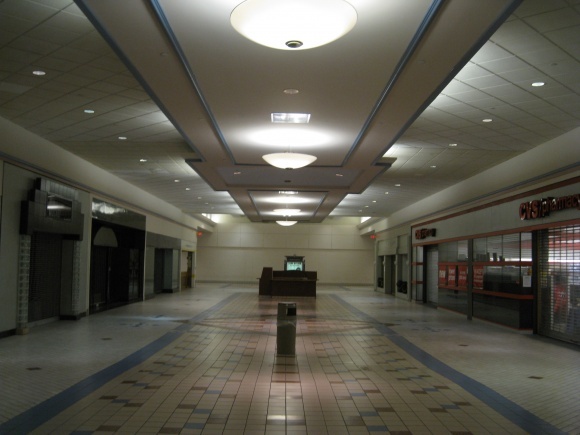 There are many factors that kill malls, the most general one is that people shop them less than 20 years ago–fewer trips per month and roughly half the time spent on a typical visit. 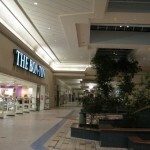 More and more malls draw different people to anchors than to inline stores and in many places one or maore anchors persevere, while the inline tenants die. Even growing areas where it’s difficult to build new malls, like Southern California have had mall death. @Rich Saying that “Columbia is more appealing to people than Frederick” is a sweeping generalization, and not a terribly accurate one. It’s not necessarily more appealing to people on the lower end of the homebuying spectrum, as most of the condos and smaller townhouses are in older neighborhoods that have had their fair share of well-publicized crime. It’s not necessarily more appealing to people who don’t plan to have kids, or to those who are priced out of areas that feed into the better county high schools (most of which aren’t even in Columbia). It’s definitely not more appealing to people who don’t want to live in a master-planned community with restrictive covenants, or those who want to be close to their jobs in Rockville, Gaithersburg, or Germantown. The cost of living in Columbia is the same as it is in Olney, the better parts of Gaithersburg, and upper Silver Spring, with far less access to public transportation, and without any payoff in terms of commute time to points northwest of DC or school quality. Frederick is a little cheaper, and the housing stock is more diverse. And while Columbia is arguably regarded as more cosmopolitan than Frederick, they’re really not too far apart in terms of cultural offerings, and neither gets much attention from the Post or much notice from people whose social lives are centered around Bethesda, Silver Spring, or DC. But really, why would they? I worked in Rockville for 2 years, and for every person who lived in Howard County or beyond, there were at least three or four who lived in Frederick — everything from ultra-conservative NRA types who felt uncomfortable in “blue” counties to gay couples who bought historic-district rowhomes on the cheap to everyday, mainstream families who wanted more space than they could afford in MontCo. That’s just my experience, but it’s one that the view of 270 at rush hour from my old office on Research Boulevard backed up. There are indeed many factors that kill malls, including their decreasing popularity in the face of big-box and lifestyle centers. That’s especially the case with smaller, regional malls whose market areas are squeezed from all directions. Frederick Towne is one of those malls. 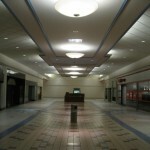 But so is FSK, and it’s kinda surprising to me that both malls haven’t suffered the same fate. Wow, I was wondering if this mall would get a page, it is one of the deadest malls I have ever seen, including Salisbury, Hunt Valley and Landover. However, the anchors seem to be doing well. This was my boyhood mall, being only about 12 miles and one traffic light from my house. 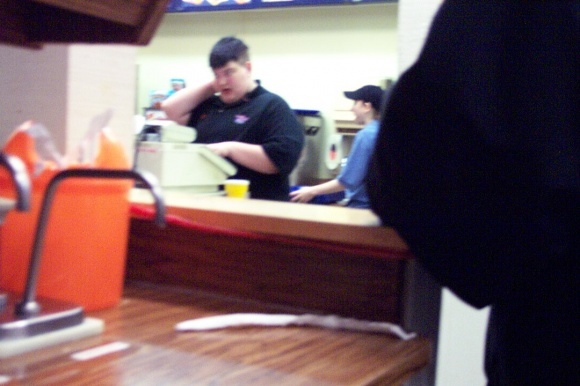 Plus my sister worked at Freindlys for years, so I spent alot of time there. 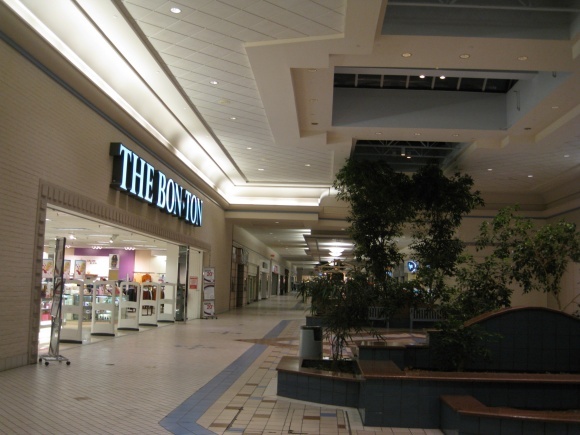 This mall was always super busy, at least until the mid to late 90’s when I stopped going as much.The Bon-Ton was an Eyerleys. Now the men’s and homewares are in the old McCrory’s space – it had a lunch counter! I got all my toys at the toy store. It ended up as a Kaybee, but it was something else before that, and was so packed with toys that it was hard to get around – very different from Toys-R-Us. 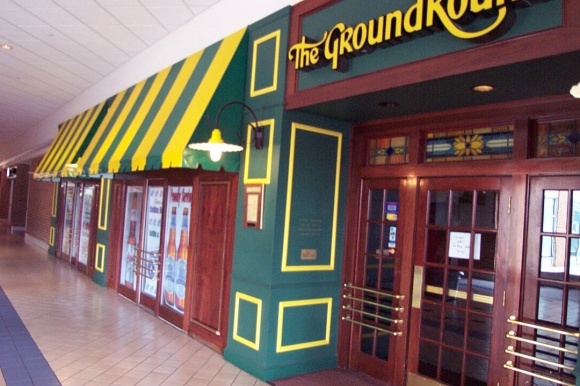 There were several different restauraunts in the Ground Round space, but the one I remember best was a pizza place that had a staircase up to an upper level that looked out over the dining room. Across from that was a good sized music store, where all us kids got instruments/supplies. 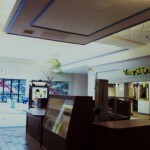 On that same (Penny’s/Boscovs) side was a jewelry store, bank, Thom McCanns (sp? ), Beefsteak Charlies I think, and the Chanticleer shoes where I got many of my shoes. 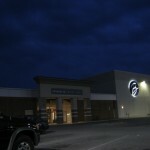 The owner recently moved to a nearby strip center, I read that he had worked at Fredricktowne since it opened. There was a quirky store called World Bazaar that had mostly cheap asian themed merchandise, but was always fun for a kid to look through. Waxie Maxies music, Time Out arcade, Waldenbooks, which lasted a long time, and a real big 2 screen theater are the ones I remember the best (There were once four movie theaters on the golden mile, just one discount one now). Wards closing hit this mall real hard. Combined with the loss of Hechingers across the street, this meant that people had to go to the 85/355 corridor for appliances and hardware. 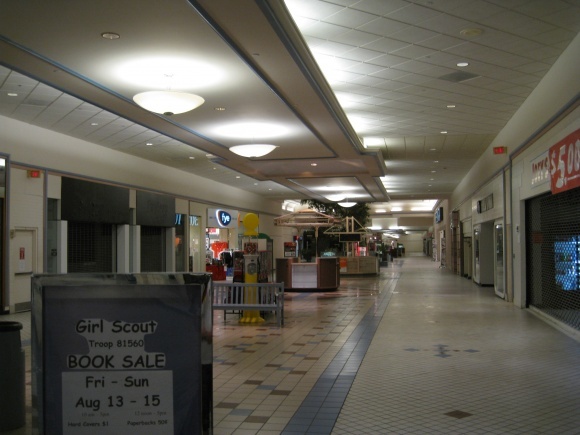 As someone else mentioned, all the big box stores are in that area now, so the only real hope I see for this mall is to tear down the empty interior and build big boxes themselves. The road system in Frederick is very poor. Because of land constraints, most of 70 is just 2 lanes each way through there, and it’s one of the most heavily congested areas in the entire Baltimore/DC area. I’ve never heard it mentioned, but a northern bypass to connect to Rt. 26 would make a lot of sense for Frederick. FSK is at least visible from 270, but it’s no pleasure to get to. You have to wind your way into it, and it really isn’t much of a mall. Then again, I’ve always preferred Frederick Towne to FSK. Outside of locals, nobody would ever know Frederick Towne was there. Frederick is having a rapid increase of Hispanics and African-Americans in recent years, and what of those groups is not centered in the Downtown areas east of 15 would be found in the housing behind and around Frederick Towne. The wealth in Frederick has shifted North and East (think the Summit Ridge area as well as into Walkersville). Also not mentioned is the lifestyle center Monocacy Crossing below FSK. A lot of mall-type stores have landed there as well, a few more upscale than you’d find at even FSK. It opened about the time Frederick Towne started going downhill. 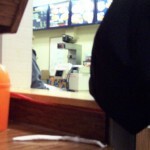 It has no real anchors, but draws people in to smaller stores, popular restaurants and a movie theater. 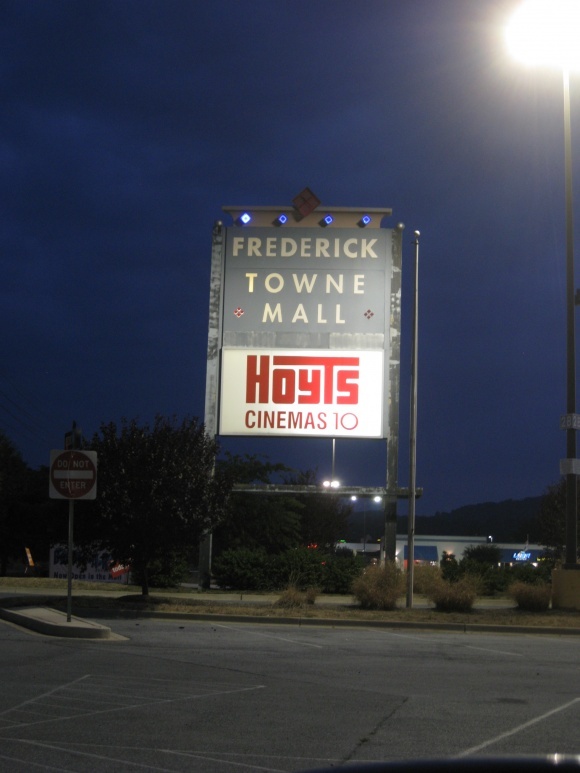 Before that, the Hoyts behind Frederick Towne would have been the best cinema in the area. Another possible explanation for the loss in traffic, although the cinema is not connected to the mall. 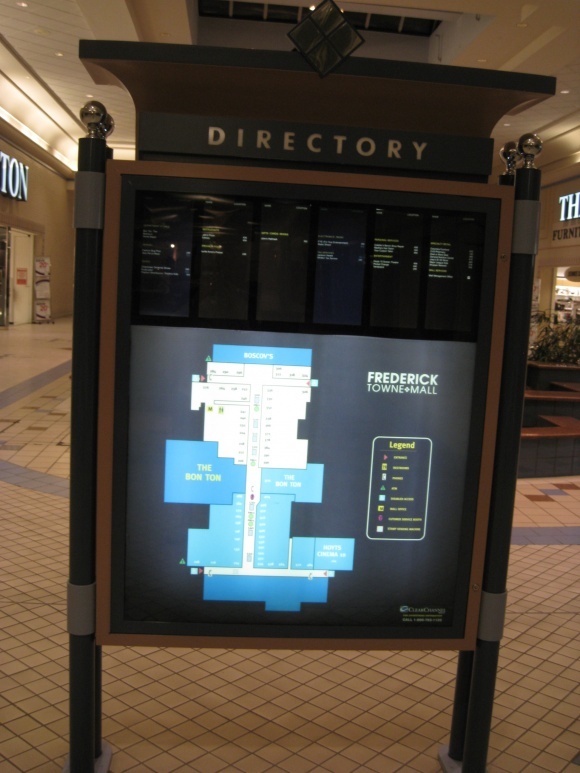 Back in the late 70’s there were plans for a SECOND mall called “Frederick Towne Mall”..but for that “other” Frederick County, the one in Virginia ( Winchester ) some 50 miles to the southwest of this mall. The mall was planned for the intersection of Virginia Route 7 and I-81..but it never came to be though two stores did open as a result of it..Safeway & Drug Fair but both ( at least in Winchester/Frederick County, VA ) are now defunct. Other than that Safeway & Drug Fair don’t remember whoelse was to be in the Virginia edition of Frederick Towne Mall….but no doubt chances are by now it would be on this very site. What a coincidence — I just went past this mall yesterday on my way to Gambrill State Park (a few miles west of Frederick). Speaking as someone who has friends in Frederick but has never lived there, I’m surprised that the two malls in town don’t coexist better than they do. They’re not terribly close to each other, and while the area around Frederick Towne is built-out and has some pockets of poverty and crime, it’s closer to most parts of town than FSK. The Golden Mile may not have the concentration of big-box monoliths that the FSK area has, but other than the mall, it doesn’t seem to be hurting either. Besides, Frederick has kind of a split personality. It’s far enough from Baltimore and DC to have an economy and culture of its own, but it’s close enough that it’s attracted droves of commuters. And while Frederick has changed a lot in the past 10-15 years, there still seems to be a cultural divide between longtime residents, who have the unpretentious, small-town mentality commonly found in smaller PA cities, and newcomers who didn’t entirely leave affluent, status-conscious Montgomery County behind when they headed up 270. Both malls predated the mass migration from the suburbs, and neither mall is really big enough to be all things to all people. If there were more of a market differentiation between them, with FSK trending more upscale, I think they could have continued to coexist while weathering the explosion in area retail. But for at least as long as I’ve lived in MD, both malls have been thoroughly mid-market. Frederick Towne has two strikes against it in the form of two anchors that don’t have the national or local clout to attract people on their own. 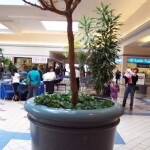 And while FSK has fared considerably better, it’s a thoroughly mediocre mall with little to offer customers from outside the immediate area — especially those from southern and eastern Frederick County, who could get to leviathans like The Mall in Columbia or Montgomery Mall almost as easily. It’s kinda sad that things worked out the way they did. But it’s hardly unusual. 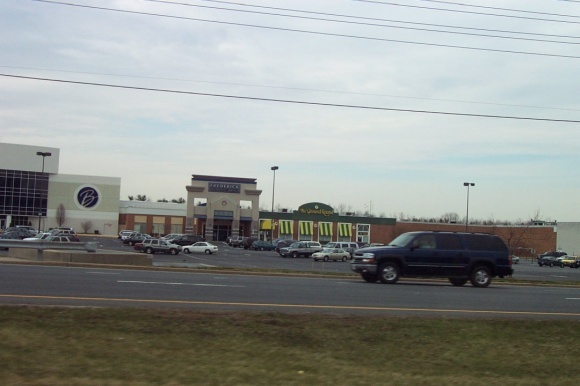 But, Yes, at one time, there was a 3rd mall in Frederick on the Golden Mile. Frederick Shoppers World was anchored by Giant Food and Kmart, which of course is still there and it looks like it is straight out of 1985 still. Giant Food moved to the “new” Westridge Square in either ’87 or ’88 and the old Mall was convereted to a strip mall shortly after. Old indoor tenants include a 3-screen theater, (where I saw “The Terminator,” “Short Circuit,” and “Goonies.”) JoAnne Fabrics, Kinney Shoes, 2 hair salons, a Chinese restaurant, a pizza place and a small arcade. It was small but I remember the mall had loud music speakers and being a kid singing along to “Walk Like an Egyptian.” with my friends from either 1st or 2nd grade at a birthday party. Oh yeah, one other thing. It is funny that at one time there were 4 movie theaters on the Golden Mile and today in 2010 the oldest one of them all, the old 2-screen Holiday Cinema, which is over 50 years old is still there and still does good business showing $3.99 movies 3 or 4 weeks after they’re released in the larger mexaplex theater across town. Hoyt’s 2, which became Hoyt’s 10 in Frederick Towne closed in November 2008 after a man was stabbed to death in the middle of the day during a showing of The Dark Knight. Hoyt’s 3 at Frederick Shoppers World closed in ’88 before Westridge’s new theatre’s were completed. 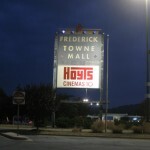 Hoyt’s Westridge 6 closed in 2002 because Hoyt’s invested so much in their 10-screen facility @ Frederick Towne Mall. 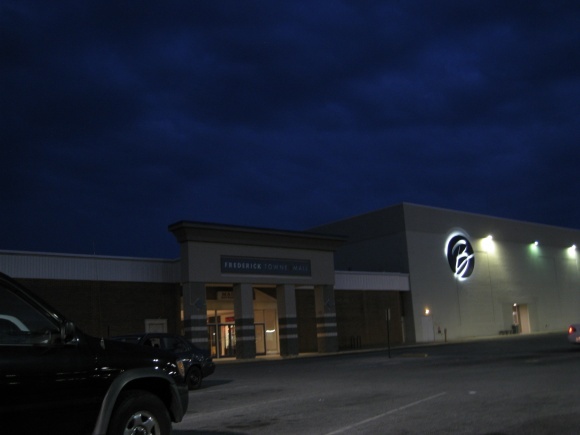 The Frederick Shoppers World was not where Kmart is. That’s Frederick County Square. Didn’t know Giant used to be there in that center. Was that the only MD-Giant in Frederick in earlier times? Obviously the stores at New Design Rd., Liberty Rd. and Monocacy Blvd. and the Urbana store have all been built much more recently. Frederick Shoppers World is where Service Merchandise, Kiddie City and Carmack-Jays were, now Giant Eagle and Petco. I think Service Merchandise and Kiddie City started as Zayre, but I’m not 100% positive on that. It was some old discounter. 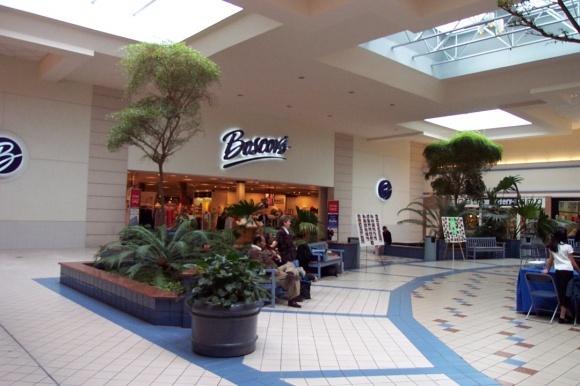 Back in the day, Frederick Towne Mall was once a great place to shop. It is a real shame that it sits as an empty shell of what it once was. It should be a fairly ideal location along the heavily traveled “Golden Mile,” with ample parking, access to I-70 and mass transit. But, it seems that the west end of Route 40 is losing its appeal. Although the “Transit” buses still stop there, it is mainly a bus transfer point and local stop for residents of nearby apts. 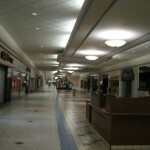 But, the mall itself is almost a ghost town. 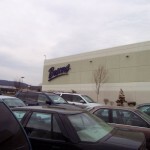 Boscov’s (the main anchor) and the Home Depot seem to hang on, as their specialty niche is now independent of the mall. But, it was not always this way. Upon any of my recent visits, I will often get flashbacks of how it once was. One has to wonder about what really happend to cause its downfall. I’m sure all the new retail development in the FSK Mall area (Kohl’s/Target) have really cut into the mall’s attractiveness as a shopping option. But, I can recall when things were quite different. In 1989, I moved to Frederick and would take the old Frederick City Transit via its Red and Blue lines to the former stop near the old Montgomery Ward store. In the days before Home Depot and Boscov’s, Wards, JC Penney’s two-level store, and the Bon Ton were the anchor stores. The center of the mall was a busy spot featuring the McCrory five and ten with a lunch counter—a very popular store then. 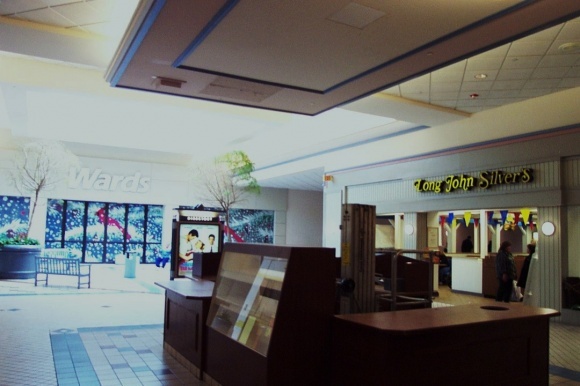 The old People’s Drug, Waldenbooks, Long John Silver’s, Arby’s, as well as many other specialty shops, provided affordable places to shop and eat. 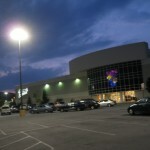 The Frederick Towne Mall Cinema was the place to see a flick on Friday and Saturday nights. n short, although the future of this location as a retail magnet remains to be seen, we do have hope that this former mall can be transformed into something much more than it is at present. Anything would be an improvement over vacant stores and and scars of signage long removed. Lets hope something interesting happens soon!!!! Hi, thank you for the pictures. 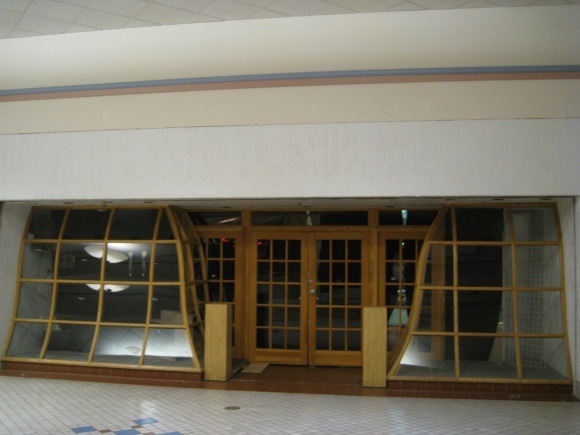 I have been living in Frederick since 1995 and I have been trying to find pictures on the internet of how Fredericktowne Mall used to look inside before all of the vacancies. 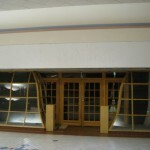 If anyone has any other nostalgic pictures of the interior of this mall, please let me know. I do hope that they revive this mall. It is so sad every time I go there now. 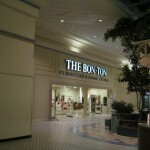 I remember when the BonTon used to be a upper-end store, carrying Ralph Lauren and other designer merchandise. Now most if not all of the designer brands are gone, and there really isn’t much there that would draw a nice crowd. 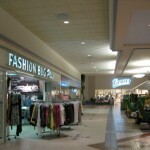 The mall as a whole used to carry nicer merchandise than FSK Mall did back in the mid 1990’s. This mall is clearly on its way out, sad to say. The expense of running something like this is astronomical. We need this economy to turn around in order to breathe some life into these malls. 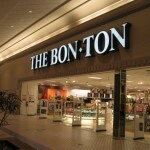 Just saw that the Bon-Ton will close in January (2011). Now the only hope for this location is to demall it and go the big box route, tearing down everything between Boscovs and Home Depot and rebuilding. @Kinverson, Yep, last I heard, construction was scheduled as soon as funds could be secured. They originally evicted stores as leases expired in hopes of rebuilding some time back. However, their failure to research the zoning on that water issue behind the mall cost quite a bit to battle and took time to settle. 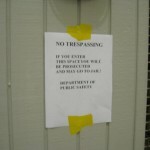 You would think they wold have finalized everything before they had started evicting retailers. It may be hard to get some to return under the circumstances. I had heard CVS would get its own structure on the parking lot. 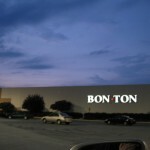 By the way, does Bon Ton own its loactaion? I ask because I recall when Wards sat empty for so long before Home Depot moved in. 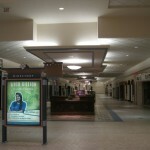 It seems Wards was there first and actually owned that building independent of the mall. That was something I had not known before. I guess Wards sat as a separate structure back n the 1960s. 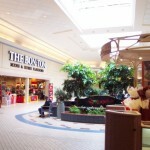 @JAMES SPEORL, No, Bon-Ton does not own its footprint, and neither, to my knowledge, does Boscovs. I don’t know why Wards owned its footprint, the 60’s were well before my time. I did work at that Home Depot for a time, though, and the store number was much lower than the other Frederick Home Depot, even though the other one on 355 opened two or three years before the Fredericktowne Mall location. I imagine that the delay was related to the Wards bankruptcy, but I don’t know for sure. The rise and fall of this mall is a sad tale indeed, and it’s been torture to see the mall I grew up frequenting go down in flames like it has. It never made sense that they put a Home Depot there, but Wards owned their space outright, so when they went belly up the site went up for auction. Boscovs does own their spot outright, purchasing it from Penneys, and gutting the place. They got some major tax breaks from Frederick City to do that, as did Home Depot if I recall right. 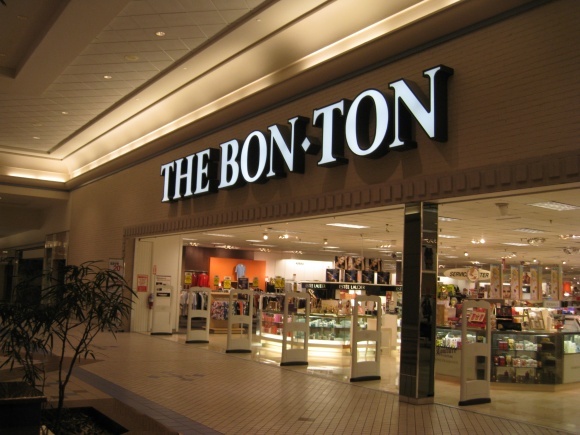 But The Bon-Ton truly is a sight for sore eyes, and I hate to say it but every time I went in to shop it seemed they were carrying less and less, and the name brands were few and far between it seemed as time went on. It was a bad sign when they closed the gift wrap dept (which they did up in Hagerstown too sadly) but once they quit carrying china/crystal/silver and doing wedding registries something told me they wouldnt be there too much longer. The back end (Home Store/Furniture, formerly Men’s Apparel) used to be McCrory’s up til about 1996 I think, and that horrible retrofit jet out in the front is where their lunch counter was. Used now for storage from what I can tell, but years ago they did a pretty good business (McCrory’s) and the lunch counter used to be booming (can you picture it, sitting there with fries and a tall coke? Just a memory in my mind now) along with the rest of the mall. The plan of the (then) owners during the early part of the last decade was to evict every shop when their lease came up and then level or remodel the place. They did just that and it backfired with the economic downturn. 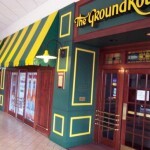 The Ground Round used to do a pretty good business, and that closing really surprised me. I showed up to meet a friend for lunch and the doors were locked and the lights were out. I don’t recall much (if any) notification of their closing, and thus a few weeks later It broke my heart to be the one to tell a group of seniors that just got off the bus for lunch that the restaurant was history. The idiots (Mall Management/Owners) left the signage and menus up and the poor seniors were banging on the door thinking they forgot to open up. It was not good, and could have been avoided if the management of the mall had taken the time to do things right…..sigh. 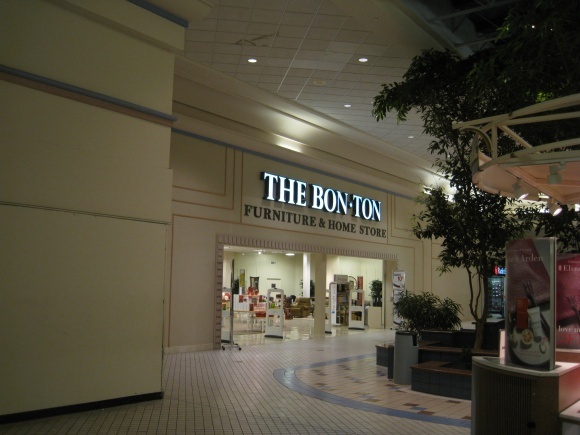 Back to Bon-Ton: From my knowledge, the lease on the former McCrory space was for another two years, and I thought they (Bon Ton) owned the larger space. My guess would be that the centers owners let them bow out before the end of the lease. One might ask after all of this and the classification as a “dead mall” have I kept coming back here? Tradition and location I guess. 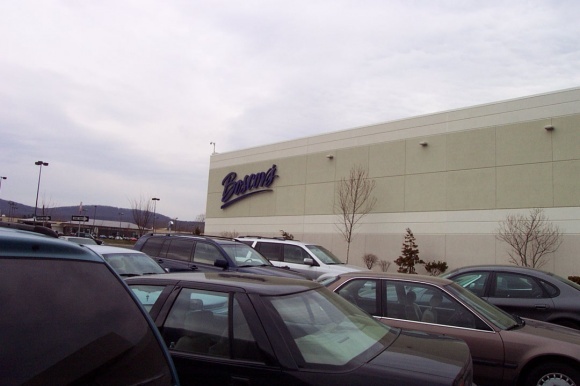 I grew up going here, and remember it when it was “hip” One can get what they need and leave quite easily considering, and Boscov’s is a great store on its own-the prices are amazing too! I’ll keep going there for specific things, but most of the time i’ll probably just bite the bullet and drive to Hagerstown. 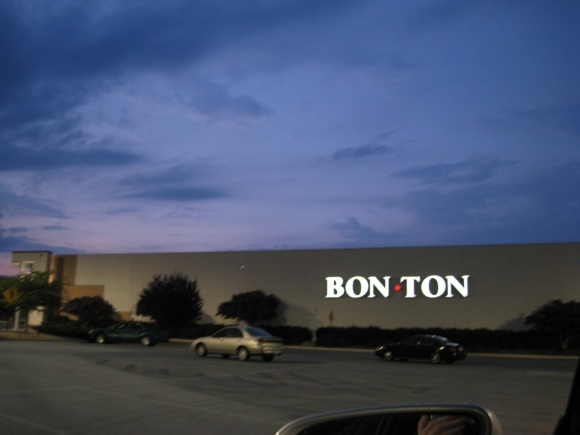 It’s not too far, and if you check out the Bon-Ton there you will think you entered some strange alternate universe…yes the two stores are THAT different. This mall has taken another turn for the worse. 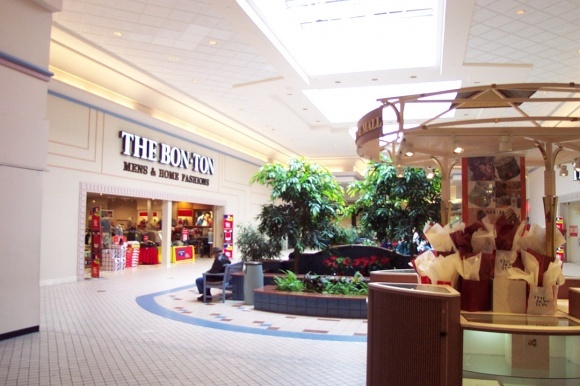 In late November the Bon-Ton announced that it was closing its doors as well. 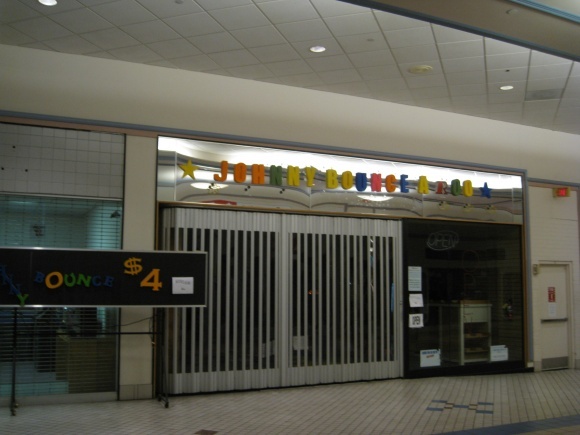 I have many memories from this mall. I got my first kiss while seeing a movie in the old Hoyts cinemas. 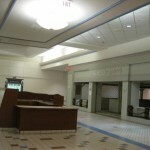 Its a shame to see the mall deteriorate the way it has. Great analysis! I’ve been in the land and commercial real estate business in Frederick for almost 40 years now. Watched the rise and fall of the “Mall.” Your assessment of what happened here is dead on. I have concerns over the expectations that City of Frederick has for its current “small area plan” to revitalize the full length of the Golden Mile. While I think that process has yielded some very good information thus far, I am always concerned when planners do not ask the owners of the properties in question to be part of the process from the start … beyond just sending them a survey. There will be a post on my blog (www.macroreportblog.com) about this topic on April 19, 2011 … with a link back to this piece! Went to visit Boscov’s and I wanted to note that the mall is now sealed off completely at Boscov’s, and traffic is no longer permitted. At a corner down the road a little, CVS is building a replacement store, and leaving the mall area. I’ll miss that CVS as it was authentic to an old Peoples that was left, of course, the FSK one still clings along (but it was a good bit smaller than the Frederick Towne one, the largest CVS I’ve ever seen). I expect demolition to come within the next year. I should also note that the opening of Wegmans in Frederick has caused the Westridge Giant to close, that center is really starting to age badly too. It’s only getting worse in West Frederick. I lived in Frederick for seven years, from 1992 to 1999, and for five of those years I was also a student at Hood College. 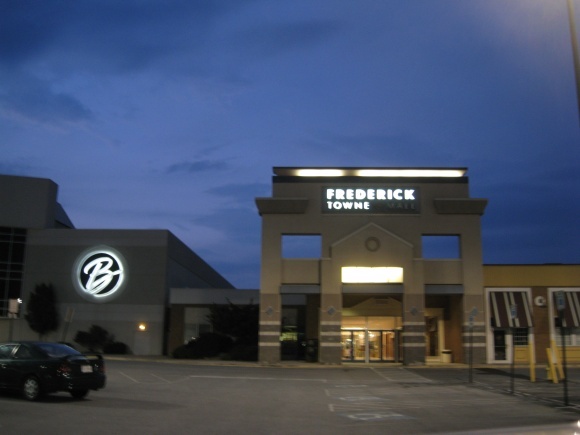 I’ve been to both malls in Frederick, but ironically Frederick Towne Mall was always the one I preferred to visit (maybe because of its reasonably close proximity to the campus and the fact that I didn’t have my car for the first three years I was a student?). I remember my freshman year when “America’s Funniest People” had tryouts at FTM, and my roommate and I tried to do a “Wayne’s World” routine-she was Wayne, and I was Garth. We spent the better part of a week making our props and practicing our skit, only to have her choke when the big moment came. Since Garth doesn’t talk much, there was VERY little I could do to save our behinds! Still, we got T-shirts from Z104 and got our picture taken with the morning show deejay, so I can’t say it was a total loss. Montgomery Wards came in handy more than once-when two of my friends and I decided to rent a place off-campus, MK was where we went to get accessories for the townhouse we rented (and flannel sheets when we found out the hard way that the older-style heat pumps and a Frederick winter did NOT mix at all!). When my husband and I started dating, Gordon’s Jeweler’s was where he went to get a necklace for my birthday, and Littman’s Jewelers was where he went for a promise ring and later, the engagement ring he gave me. How many movies did my friends and I go to on the weekends at the movie theater there? I can’t remember. It’s sad to see Frederick Towne Mall dying like this, but between the neighborhood, Carroll Creek’s habit of flooding when there’s severe rain (my friends and I used to joke that Baker Park downtown became Baker LAKE every time the creek flooded, it was that bad), the economic downturn, and the rise of all the shopping centers around Francis Scott Key Mall, it’s not really all that surprising. It’s still a pity though.